Push the brake pedal down. Control the pressure so the vehicle comes to a smooth, safe stop. If you have a manual transmission, don’t push the clutch in until the engine rpm is down close to idle. When stopped, select a starting gear. ABS helps you avoid wheel lock up. The computer senses impending lockup, reduces the braking pressure to a safe level, and you maintain control. When only the tractor has ABS, you should be able to maintain steering control, and there is less chance of jackknifing. But, keep your eye on the trailer and let up on the brakes (if you can safely do so) if it begins to swing out. When only the trailer has ABS, the trailer is less likely to swing out, but if you lose steering control or start a tractor jackknife, let up on the brakes (if you can safely do so) until you gain control. Brake the same way, regardless of whether you have ABS on the tractor, the trailer, or both. There is only one exception to this procedure, if you always drive a straight truck or combination with working ABS on all axles, in an emergency stop, you can fully apply the brakes. Stopping distance was described in Section 2 under “Speed and Stopping Distance.” With air brakes there is an added delay — “Brake Lag.” This is the time required for the brakes to work after the brake pedal is pushed. With hydraulic brakes (used on cars and light/medium trucks), the brakes work instantly. However, with air brakes, it takes a little time (one half second or more) for the air to flow through the lines to the brakes. 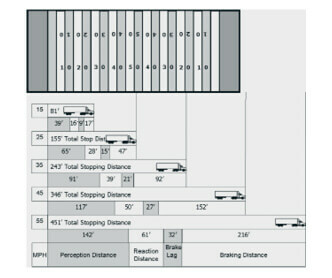 Thus, the total stopping distance for vehicles with air brake systems is made up of four different factors. Any time you park, use the parking brakes, except as noted below. Pull the parking brake control knob out to apply the parking brakes, push it in to release. The control will be a yellow, diamond-shaped knob labeled “parking brakes” on newer vehicles. On older vehicles, it may be a round blue knob or some other shape (including a lever that swings from side to side or up and down). Don’t use the parking brakes if the brakes are very hot (from just having come down a steep grade), or if the brakes are very wet in freezing temperatures. If they are used while they are very hot, they can be damaged by the heat. If they are used in freezing temperatures when the brakes are very wet, they can freeze so the vehicle cannot move. Use wheel chocks on a level surface to hold the vehicle. Let hot brakes cool before using the parking brakes. If the brakes are wet, use the brakes lightly while driving in a low gear to heat and dry them.